Tell your friends to drop in to our Info Session Wednesday 9AM: Get on Board...APPLY NOW for September! 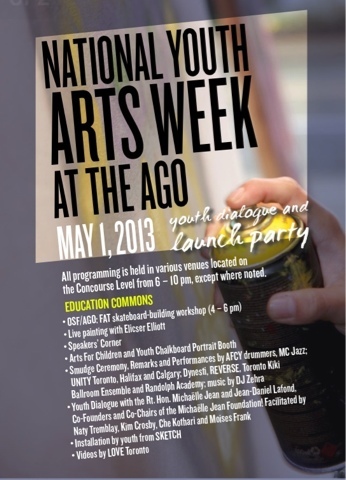 Collaboration with OCADU design student results in New OSF Flyer! This looks sooo sick!!! Thanks Emily Chan! 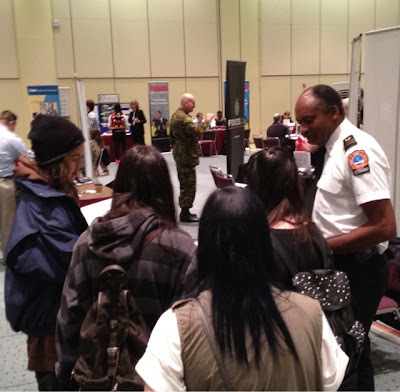 Information Sessions held in the OSF Classroom every Wednesday at 9AM. Follow link here for more info. 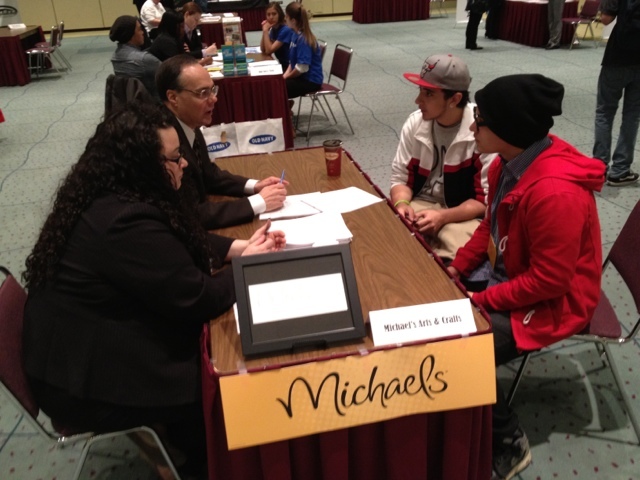 APPLY NOW: Expanded Course Options for 2013/14! 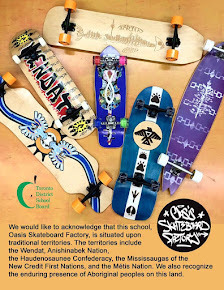 Oasis Skateboard Factory is Toronto’s innovative and award-winning skateboard design and street art focused alternative high school reengagement program. 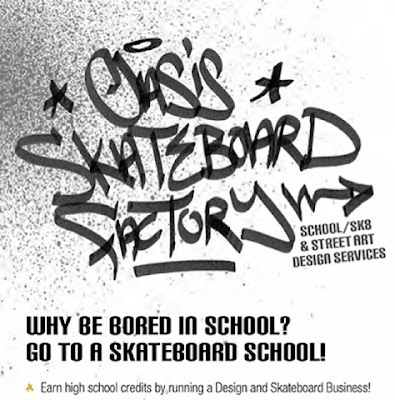 At OSF students earn all their credits by running an entrepreneurial business and design service where they learn hands-on to build skateboards, design original custom graphics, work with local designers and community partners, market and display their work and receive financial remuneration. During our programming year 2012-2013 the Art Gallery of Ontario & Oasis Skateboard Factory (OSF) collaborated on a series of free skateboard building workshops led by and for youth. 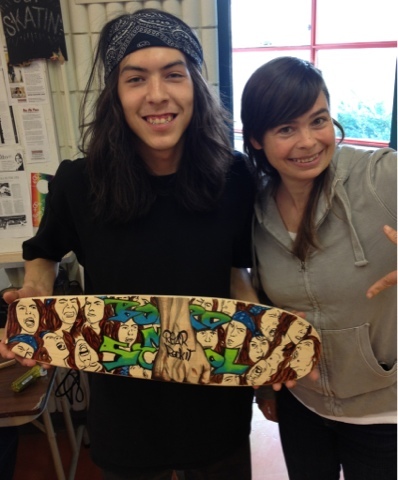 OSF leadership students developed leadership and teaching skills through teaching participants how to build their own skateboards from scratch, and how to deck it out with their original designs! 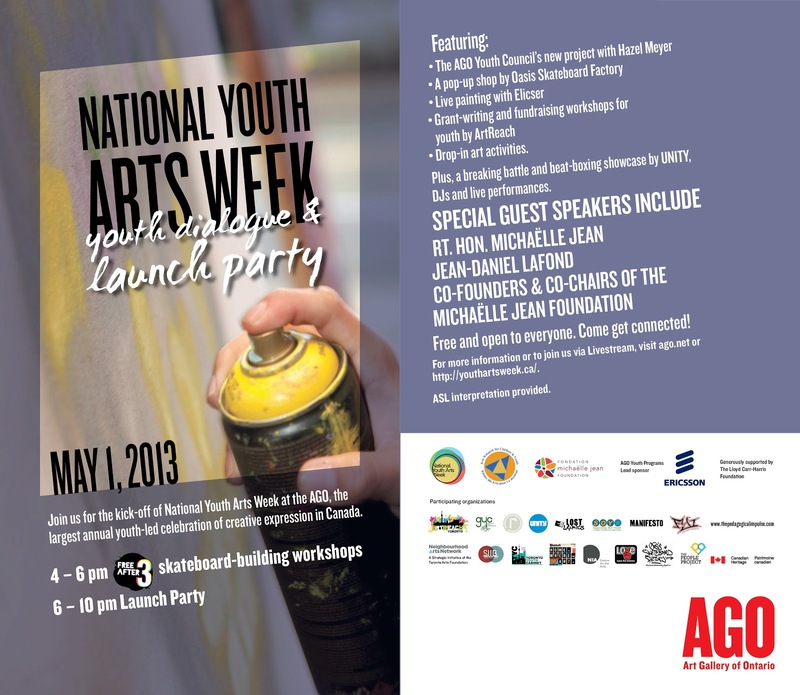 OSF x AGO workshops run through the AGO's Free After Three workshops every Wednesday from 4-6pm until June 5, 2013. 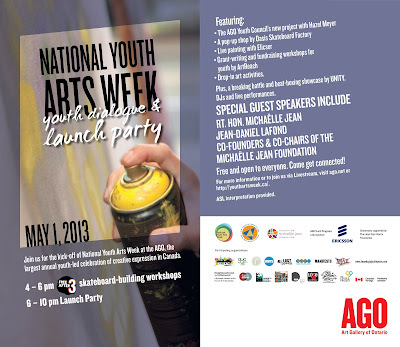 Free and open to everyone. Refreshments and fun provided! Come get connected! Special guest speakers include Mme. Michaelle Jean! ASL interpretation provided. Family friendly- programming for all ages! 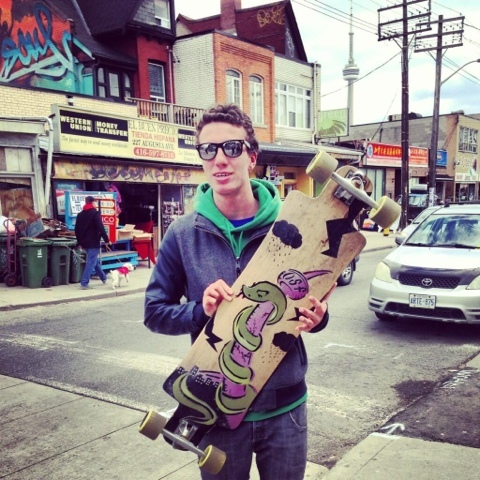 Ryan from Longboard Living took a snap of a skater in Kensington Market who happened to be riding an OG OSF prototype from years ago! 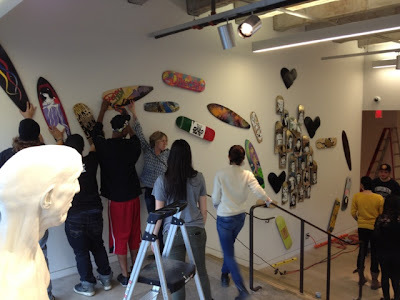 Generous Partners & Patrons, Proud Parents...and skaters skating inside the gallery: Thanks for this awesome event! 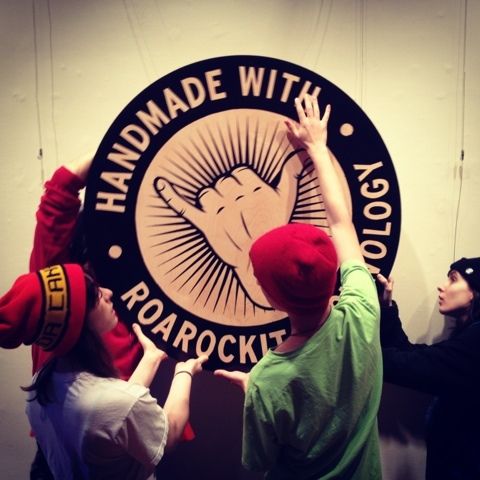 OSF installing the ROAROCKIT logo at GLADSTONE HOTEL: Silent Auction of artist collab boards 7-10PM TONIGHT! TONIGHT! 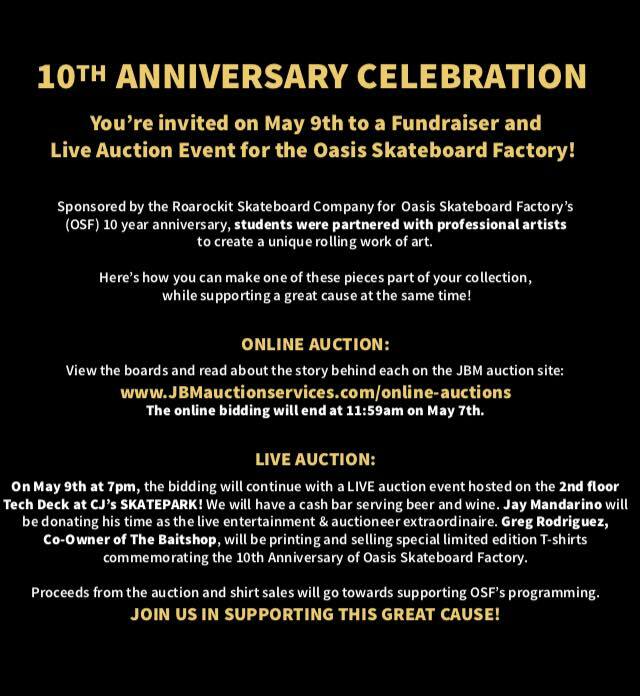 Support OASIS SKATEBOARD FACTORY school Silent Auction: OSF x ROAROCKIT x GLADSTONE HOTEL 7-10PM! 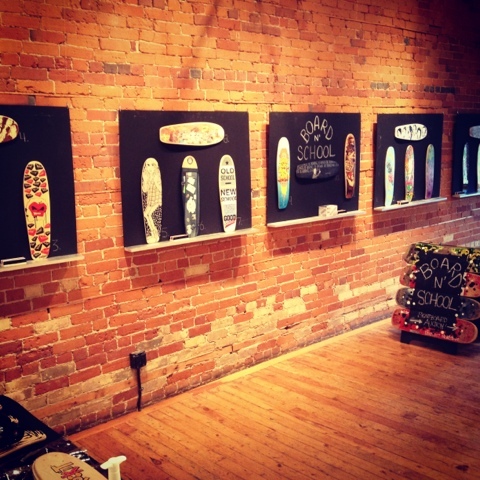 Come bid on Toronto's favorite Artists x OSF x Roarockit boards at Gladstone Hotel Friday 7-10pm! Support OSF school! 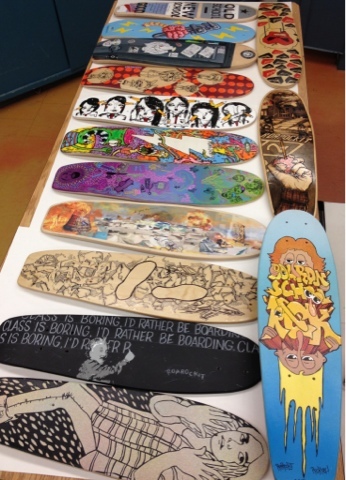 This is my first semester at Oasis Skateboard Factory. I've lived in Toronto all my life. I’ve never moved except when it came to schools. I was jumping from school to school trying to find the right fit for me. Throughout high school I was never really active or played any sports; I was mostly only just acing my art classes. 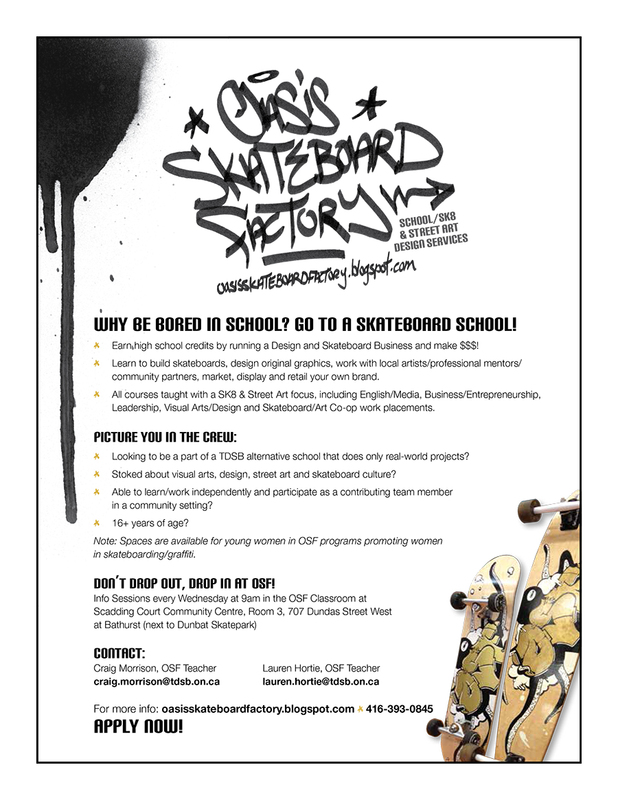 When I first heard of OSF I really didn't consider the school as I had no experience skateboarding. Once I heard drawing and design was involved I thought it would be an interesting experience. Turns out I am now showing up to school, enjoying waking up to come to class to finish projects, and share some new drawings. I was never too confident about my art till I went to OSF. I felt like my art is finally starting to be appreciated. I have started drawing again like crazy. Now I've been drawing way more then I used too. For my first board I decided to do a doll from my favorite anime "Another". She always kind of creeped me out in a beautiful way. There’s something about dolls I’m so drawn too. My love for creepy, gory looking dolls started when I was 10 years old and my dad brought me home this doll in a coffin from the brand "Living Dead Dolls". I guess those dolls replaced my "Barbie phase". 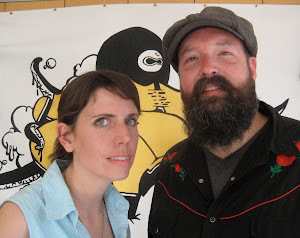 Many artists and characters have inspired me, like Shary Boyle, Mary Pratt, Tim Burton, Emily the Strange, John Tenniel, and the list goes on. 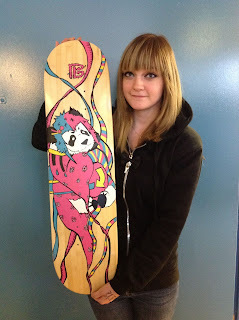 I plan to make more longboards with my original drawings of dolls in the future. Rollin' artworks roll into the classroom in preparation for the OSF x Roarockit x Gladstone Hotel Art Bar auction this Friday 7PM! 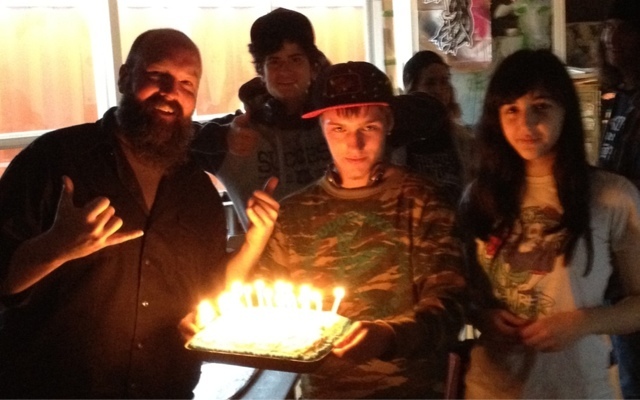 The best birthday present is working with youth challenging themselves to succeed: OSF boasts a 97% course pass rate at Mid-terms! 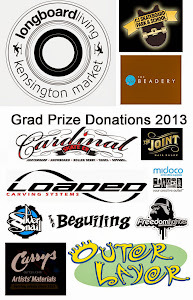 Support the Stoke...bring your friends out to our Silent Auction this Friday! 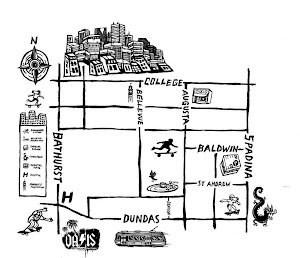 OSF is on the Map! I am from Toronto, Ontario. I just turned 18 a couple weeks ago, and it really doesn't feel like I am. My style of art leans towards the anime manga style. I love designing my own characters. When I figured out I could make my own characters I started drawing, that was when I was 13 years old. I'm still not very good, but I think I'm getting to a place where I am happy with my art. 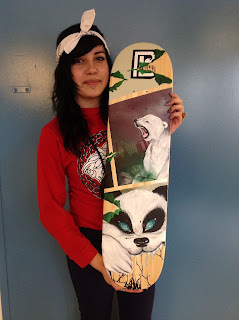 My skateboard design represents your mascot, the panda. I've never drawn a panda before so I took this as an opportunity. My template shows your mascot trying to stop a really big problem in Alberta, Canada called the Tar Sands. The Tar Sands is a giant hole in the ground. Workers come with their giant trucks and just dig and dig until there’s barely anything to scrape out. They use chemicals and oils, and dirty the water nearby. Animals can get caught in these oils and they can end up with giant tumors. They have giant factories that pollute the water and they have these tubes that go into the lakes and let out all the chemicals. Birds will try to fly in and rest in those lakes, and end up not being able to fly away. The panda doesn't want his other animal friends to have to go through this, so he is holding a stop sign that has a sticker on it that says "Tar Sands". He is sitting in the middle of the giant tar sands so that the trucks can't move in. The factory is in the background showing how close it is to the tar sands. The background is a stormy sky, giving it the feeling that it is a very gloomy sad day. The outside border has tar dripping all over the board. 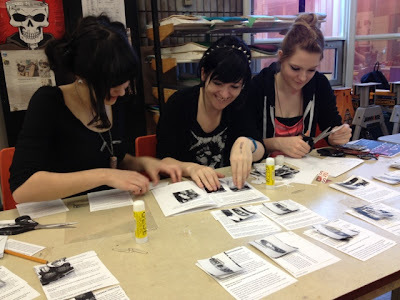 I didn't have to research anything for this project because we had teachers come in and show us what is happening in Alberta. In order to create this board I started off by taping up the whole board with green tape. Then I taped carbon paper on top of the board on the taped side, and then placed our template on top. I then traced out the first layer of the board, which is the dripping oil. I untapped the template and carbon paper, and started cutting my lines with a knife. After my stencil was all cut out, I went outside and spray painted it. After the paint was dry I peeled the tape off to see how the board looked. Then I repeated the above process, except I didn’t use the carbon paper, I redrew everything on top of the tape. In my design I used the elements colour, line, size, gradation. I am really happy with the outcome of this skateboard. At first I thought the design I picked would be really hard, but the techniques I used made it easier and fun. This contest with Bamboo SK8 made me really try to work hard on something, and I haven’t had that feeling in a long time. 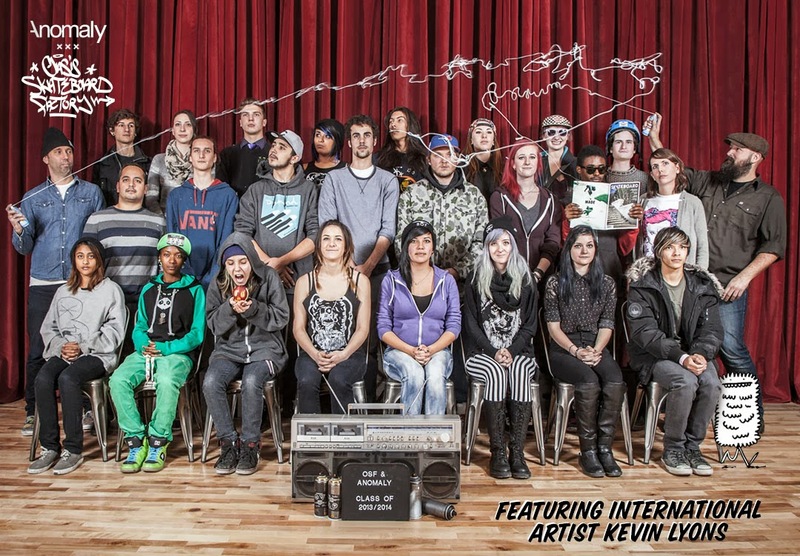 I truly think it was an honour to be able to participate in this contest and work with Bamboo SK8. 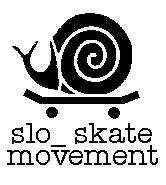 This is the first graphic I’ve ever put on a skateboard and this taught me that process. I learned how to meet a deadline; usually I’m pretty bad with those. The topic sustainability is a hard topic for me because I didn’t know a lot about it. I had to do a lot of research about sustainability to get ideas about what to do for my design and I learned a lot of things from it. I want to thank Bamboo SK8 for this amazing opportunity. Hey guys, as you know I'm a student at OSF, just started, and I love it here. Through this school I've learned a lot about current events happening all over the world, including the companies that open your eyes to sustainable ideas. I think that it’s awesome that a business actually puts effort into being conservative of resources. Companies all around the world with huge carbon footprints aren't as considerate, as you may know they can be pretty wasteful. That's exactly what ties into the theme of my board, which is being wasteful and treating this planet like we have another one to go to. Lavish Living means to live wasteful. Abusing resources for no good reason just to have a slightly more luxurious life. Whenever you see a new condo or another "fog-monster" factory in your city, it means that trees are replaced with concrete, and more energy is used thus emitting more carbon. The little panda slaving away to treat this rich-looking skeleton represents us slowly killing earth. The skeleton is the symbol for death and the baby panda is our precious little planet that we call our home. I had about 17 different layers and hand painted the last little bit. For some of the tiny details, I was able to use this awesome stuff called frisket film. It's similar to taping up your board and cutting out your design, but instead its a completely see through thin piece of plastic with very little adhesive. Being able to see through tape is key, we have a lot of details that we don't exactly see placed on the board, so being able to see-through stops from having to peel tape off over and over again for each layer. Also, the little bit of adhesive doesn't lift off paint when placed on top of your board. The outcome was definitely a relief. It was a lot of work, but in the end my graphic came out almost exact as to what my original design was. All the colours made even more layers to work with, but it was way worth it in the end. Through this project I learned a ton on sustainability issues, but also realized how hard you have to work for something to look good and complete. 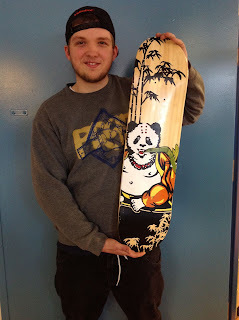 I had a blast working with the Bamboo Skateboards and hope you guys like my design. Hello, I’m a 17-year-old girl. 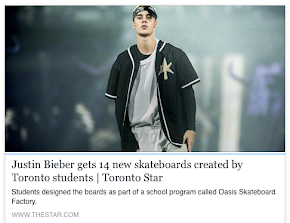 It’s my second semester at Oasis Skateboard Factory and the first time I’ve heard about your company. I’ve learned interesting things about Bamboo Skateboards and the message that you guys are spreading about sustainability is great! Throughout the unit we started learning about sustainability, mostly everything that I have learned about sustainability is new to me. We learned what the Tar Sands were and about oil factories that cause deforestation. This is what the theme of my graphic is about. The animals are the ones that are suffering and, because they don’t have the same rights that we do, they are ignored. My graphic incorporates the two images of two different animals that are threatened: the panda and the polar bear. I decided to make my design into a comic, so it’s showing you that things can be happening at the same time around the world. I chose a polar bear out of all the animals because it represents that even though they live in a cold environment away from all that bamboo, the oil factories still affect the water; which is what they need the most. Both of these bears are in very different parts of the world, but these oil factories still affect them all the same. In my graphic I incorporated the silhouette of an oil factory and tar sands that the polar bear is sitting on. Tar sands are huge, so that’s why I made the polar bear bigger than the tar sand, to represent this monstrous destructive animal that’s crying for its environment. I made the polar bear hold a fragile plant to represent that its environment is being endangered. The panda bear has those crazy eyes to represent all the rage it has. I made the panda biting onto the skateboard and ripping it apart to represent everything that has been destroyed and taken away from them. The techniques I used to make my graphic come to life were tape stencils to do the different layers for the background and spray paint to add all the colours I used. For the bears I hand painted it using acrylic paint. For the final touch I used a clear semi-gloss to seal the graphic onto the board. I used contrast between the bamboo wood and the dull looking colours to make the comic book style pop more. I love animals and I believe that with generosity and loving care that we can connect to our animals of the earth that will result a positive outcome. I was so excited to start on this project, I love the concept of Bamboo skateboards and just even doing a board for your company is an honour. This project keeps you aware of things that are happening to our earth, just like a plant, it needs to be taken care of. With your company, you create awareness around the world about the environment and saving our ecosystem starts with awareness. 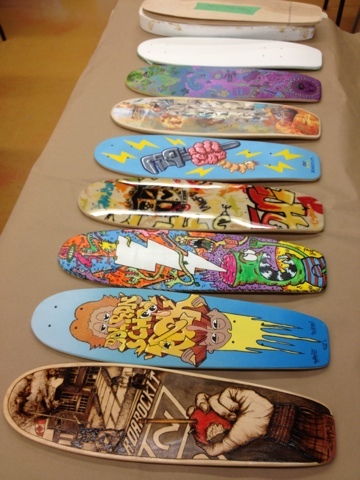 Hello Bamboo Skateboards!!! I'm 17, and a new student here at Oasis Skateboard Factory. I've been drawing for as long as I can remember, but didn't really start taking it seriously until grade 8. OSF so far has been amazing; it’s really been a dream come true. I get to apply my love for art, and hands on work everyday and get to meet new people and work on amazing projects with awesome companies, such as this one were doing with you guys :). My main idea for the bamboo board graphic was the OSF octopus scrubbing the oily goop off the surface world, and stopping the drips of oil from falling and destroying more of the underwater life, and the water itself. This to me shows how we (not only the OSF crew but other skaters, artists, designers, anyone really) try to protect our environment, and natural resources. The octopus has its arm up holding the brush, in victory because it’s cleaning up the mess the oil companies and society has made. Working on this project was a bit stressful, but it was a great experience overall. My graphic turned out better then I planned in my opinion. I loved that I was able to do some sick colour blending with the different coral pieces and the water. I think the graphic depicts my want to protect underwater life clearly and people will understand my idea when they see it. I'm so happy I'm being given the chance to shed light on such an important issue. Our water (seas, oceans, rivers etc.) is pretty much our life source. Without water, living things can't live. So we need to cherish and protect the water, and all the living creatures in it! Of course I hope I win the contest but if I don't, I'll still feel that I've won because I get a dope bamboo board with a super meaningful graphic! I love pandas. This is my second semester at OSF and I love it here! Everyone here is open-minded and non-judgmental and I get along with everyone. I love this school because it lets me create. Before I came here, my creativity and resources were limited. Now at OSF nothing is impossible. It lets me be creative to my full potential. The design for my bamboo board is a crying panda hugging the world. There is a huge crack in the earth to represent the destruction that has been done by actions that are not helpful to the environment and unsustainable. The panda is crying because it is sad that the world is falling apart. In my graphic the world is falling apart and this represents the destruction that is going on right now all around the world. The panda is comforting the world because it wants to make it feel better and it wants to be comforted too. If we want to actually make changes to make the world a better place, we need to work at it. The panda in my graphic represents this idea. We need to help each other to make the world a better place by taking actions that help the environment and promote sustainability. If we work toward a sustainable future, then bamboo will be around forever and pandas should be around forever too. This is what we need to work toward. When designing my board I started out by spraying the background first. Then I taped my board and cut out my designs and painted them one colour at a time until my whole design was complete. After the last colour was done, I pulled off all the tape and touched up parts with a paint marker. Once all the touch up is done I put three layers of gloss to finish the board. I was really excited to create a board that features my favorite animal and has a message that will help them to survive. I like to create graphics and this one really meant something to me. There are a million ways that I compare myself to a panda and hugging for comfort is just one. This design let me express that. I'm an eighteen-year-old girl living in Toronto, Ontario. My hobbies are digital art and fashion inspired from Harajuku style in Tokyo, Japan. My look and my brand express my love for Japanese culture: Anime/Manga, Cosplay, fashion and music as well as their traditions and history. This is my first year attending Oasis Skateboard Factory and I love it! I've made great new friends and can spend the entire day working on art; I honestly couldn't ask for a better school. The greatest thing about being here is that I can learn about skateboarding and hopefully soon know how to skateboard. With the brand that I created I want to show girly girls like me can skateboard too. I'll bring my Harajuku style with skater mixed and touch of cute! My design represents the crucial awareness of protecting our planet and the animals around us. Our carbon footprint is massive and every thing we do affects the world. I chose a panda, not only because its Bamboo SK8's mascot, but because a panda is also an important image to children, culture and the world. The panda is an endangered species, threatened by continued habitat loss and by a very low birthrate, both in the wild and in captivity. My design features a panda being cute and innocent as they usually are. It is holding a toy ball and a strong symbol that holds a solution to our current problems: the recycling symbol. Something so easy to do yet people seem to be unaware of how crucial it really is. The design is meant to have an impact; an image that shows something that looks innocent but in reality, most pandas are in captivity or always being watched, filmed or sometimes secretly hunted even though its illegal. Our decisions affect those around us, for instance, the disaster in Japan destroyed pandas habitat there, causing them to be sent somewhere where they need to learn how to adapt if they can…pandas are extremely smart animals. One reason the panda is so vulnerable is that bamboo dies off periodically after blooming and pandas so dislike people that they would starve rather than cross an inhabited area to find a fresh source of food. Now to explain the process of how I put my design on. I drew out a template of the bamboo board. On the template I then proceeded to draw out my design. Once I felt the rough layout of the design was complete, I chose colours I thought suited my theme (because in harajuku fashion, they love to use vibrant colours in most of there many differently styles, I chose colours that were exactly that.) Once I finished colouring in the design, I taped the entire board and then also begun to tape carbon paper underneath my design and then taped both the carbon paper which was taped to the design onto the board. The next thing I did was then decided which layer I was going to do first! I choose to do the pink because it was the colour used the most on the design, I traced out the entire base of the design and then I used an x-acto knife and cut the inside of the traced base of the design and spray painted it pink! Once the spray paint of that layer dried I then peeled off that set of tape, re-taped it then I then choose the next decided layer and repeat! Once I was done spray painting each layer on I then traced out and then stenciled out the lining of the design and cut it out with the x-acto knife and then spray painted the stenciled out linking in black- after that layer of spray paint dried I peeled off that set of tape and then touched up little things with paint marker and then my design was complete! I'm really proud of the outcome because this was also my first board and was great experience for me as a first and I'm really glad my first board was for Bamboo SK8! This will be my 4th semester at this awesome Oasis school and I'm really grateful to have the opportunity to work on this project, even if it’s my second time doing it, ha-ha :p. I incorporated my brand “Thumper” into this project thus the reason for the bunny. The concept of this board is how our actions are affecting wildlife. What you see in this graphic is a dying bunny with plastic rings around its neck. How did they get there? By people not properly putting their garbage where it’s supposed to be, and by not taking care of this, animals like this bunny get extremely injured or even die because of peoples’ stupid actions. The reason I made this graphic was for everyone to look at it and think deeply about what their actions do to wildlife and to themselves. Land pollution is pollution of the Earth’s natural land surface by industrial, commercial, domestic and agricultural activities. This is because we don't recycle. No one thinks about what that might do to a poor little bunny or to any other wildlife that’s in the area. I strongly approve of throwing waste in its proper place. It does not belong on the floor. It belongs in a garbage or a recycling box. I strongly advise everyone to do the same. It benefits us all in the long run, for our health, safety and most importantly for the wellbeing of the wildlife. Throwing out your garbage and keeping the earth safe is just something that should be done. Why would you want to live in filth? Do you throw trash on your floor in your home? I didn't think so, so why do it to the animals’ home? Now think about that one. I’m grateful to work with Bamboo Skateboards, a company that is focusing on the betterment of the environment and improving the earth. 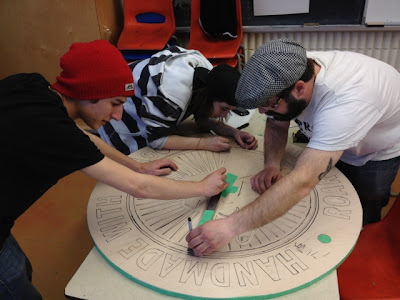 Thanks for working with OSF and giving students the opportunity to work on such an important project! 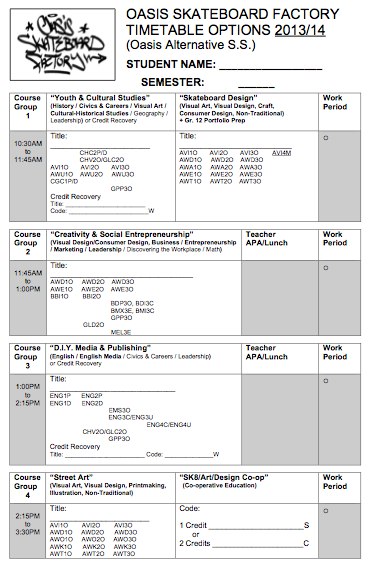 This is my second semester at OSF. Building skateboards is awesome, but my true passion has always been writing, starting with fiction and expanding to everything else. 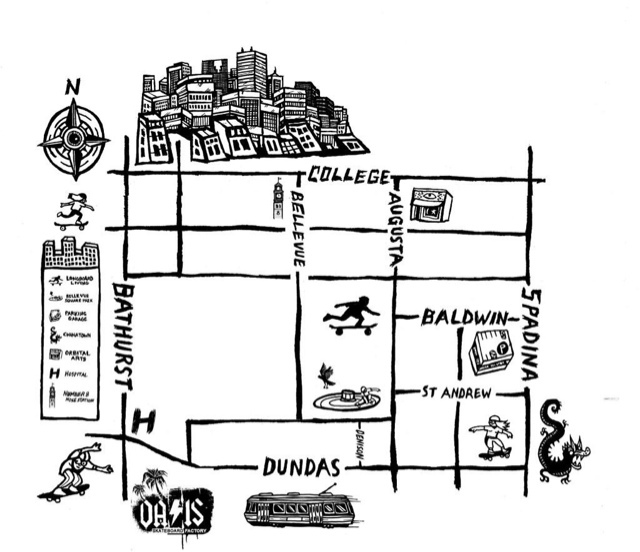 I came to OSF because writers must also be business people and I wanted to learn more about creating merchandise and branding for the ezine I'm preparing to launch: Centre of the Universe, Battling Ignorance (http://centreoftheuniversezine.wordpress.com). This school has given me the opportunity to work with professional artists and create merchandise to go with my ezine, putting me well ahead of many other brand new ezines. Most recently I was given the opportunity to create this board for Bamboo Skateboards, a company focused on sustainability. 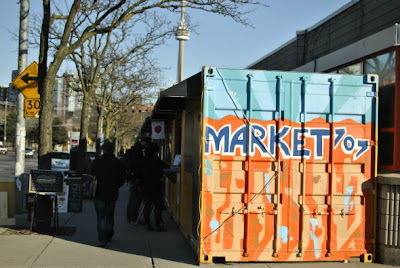 The challenge was to incorporate sustainability concepts into our design. I challenged myself to also incorporate my brand, and this is what I came up with. “Self taught” is my slogan and the idea is that we teach ourselves about caring for the planet, in this case about recycling. Many people in my generation have parents who litter or who just don't recycle. It's up to us to make sure we recycle and to know what we can recycle. Thus the graphic on the board shows someone throwing a spray paint can into a recycling bin, implying that this person went out and discovered recycling him or herself. 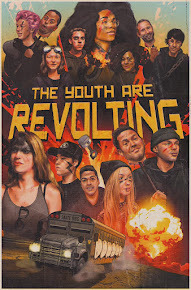 But the imagery isn't just about what's happening on the board. It's about the fact that we need to pay more attention and educate ourselves about sustainability. We need to learn how to lessen the impact we have on the environment and take action on what we've learned. My hope is that this board will inspire everyone who sees it to learn more about how to care for our planet. Making this board was both simple and challenging. The most difficult part was creating the brick wall background. Drawing straight lines on a curved surface isn't easy. It's a long tedious process. That layer alone took me an entire day to draw. Placing the words properly around the hand and recycling bin was also pretty difficult. At times I hated this board, but I pushed through the hard parts and ended up with a board that looks even better than I'd imagined. The one addition I made in the final stages of creating this board was two recycling bins, one on the nose and one on the tail of the board. I did this to balance the board because it looked odd with the nose and tail blank. It wasn't a big change, but I feel like it made all the difference in making the graphic amazing. Participating in this contest has been truly awesome as environmental issues are one of the main topics I plan to tackle in my ezine: Centre of the Universe: Battling Ignorance. Not only has designing my board been a great learning process, but it's been amazing to watch what the other students have created. 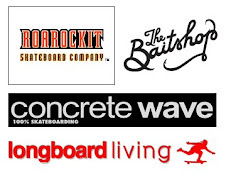 Working with a professional skateboard company such as Bamboo Skateboards has also been a great experience. It's been challenging to incorporate the different ideas they gave me during the feedback process, but nobody accomplishes great things unless they challenge themselves. 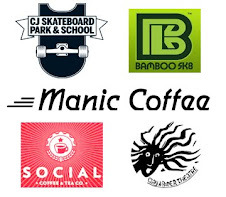 All in all, I'm excited for the chance to win the contest, but if I don't, it's no biggie--it just means I get to keep an awesome branded bamboo board. 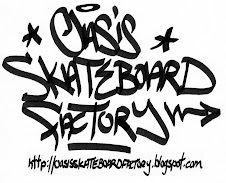 This is my first semester at Oasis Skateboard Factory. My Bamboo board design is based on the idea of an urban roof top garden. The graphic is a cherry blossom on top of a building. I chose the Cherry Blossom because traditionally it represents strength and power; the roots are taking over the city building to show the power of nature. Roof top gardens absorb the heat that can potentially destroy the ozone, so the trees and gardens are saving us from ourselves. The Bamboo Skateboards symbol is incorporated into the graphic of the tree because as a company Bamboo Skateboards is making a difference by using bamboo instead of Canadian maple that is hard to sustain. Bamboo is a fiber that will keep producing itself, so there is not the impact that we see with traditional forestry. I love working with watercolour and acrylic painting. I was pretty happy with the idea of being able to hand paint some of my bamboo board. The blossoms on the board are hand-painted with acrylics because I wanted to give them texture and individuality. The other parts of the graphic were stenciled and spray-painted with the help of some paint markers for the finishing touch. I also used a lot of organic lines to capture the wildness of Cherry Blossoms. 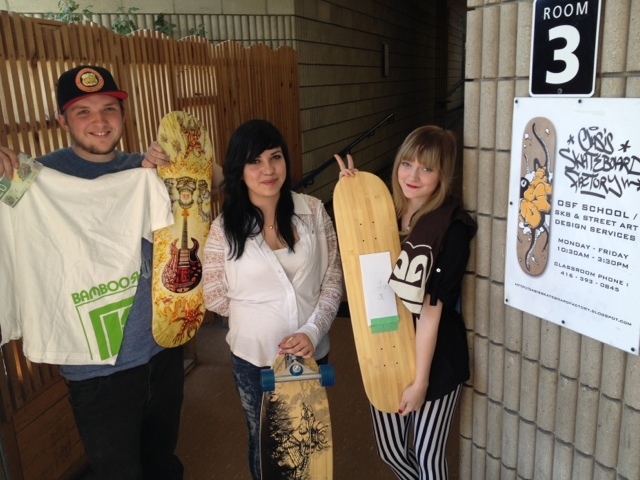 Bamboo Skateboards gives opportunities for others to use something eco-friendly and not leave a carbon footprint. I learned that there are environmentally friendly opportunities for a lot of things, even skateboards. A first year student at OSF, I'm extremely excited to be able to collaborate with you guys. I also think it's amazing what your doing with bamboo! There really is no comparison to a regular maple deck. My graphic shows that using bamboo is not only better for skateboards but also better for our environment. My bamboo skater is standing on a cliff overlooking a ginormous forest of evergreens with some mountains. The mountains supply our forests and other surrounding areas with some of the cleanest water in the world that has been melting from glaciers, which are becoming more and more dirty day by day from deforestation for materials for skateboards, mining and many other reasons. I think personally the less we have to mess with our irreplaceable resources the better it will be for our planet as a whole. I took a different route when making my graphic. Instead of the regular spray painting which usually clogs up the natural beautiful grain of the bamboo, I chose to air brush my graphic with water based paints that seeped deep in to the wood to enhance the grain of each individual bamboo strand. At first I started off with the blue green and light brown background then I moved in to more detail with my bamboo skater and I finished off my detailing with paint marker. It took me a while to get it right. At first I tried the graphic in spray paint but I really didn’t like the texture or overall look of the graphic so I sanded the whole thing down and started over in airbrush. When I was first thinking of a design I had total artist block. I couldn’t think of anything to do for sustainability then it all kind of came together in one night and when I finally had my graphic picked I really didn’t want the whole thing to be complete. Just to see how the bamboo took to the paint was truly amazing. In the long run it was an amazing experience and I loved being able to put my version of sustainability on to something that could be seen by the whole world. Simple, yet effective as always, black and white is just timeless… too bad the dinosaurs weren’t. My name TRNE TRKS, I’ve been an Oasis student for too long and they’ve been the greatest years of my life. This is my second time doing the Bamboo SK8 project; it’s such a privilege to work for such a recognized and high-end company so you know I put in my best effort. This graphic took me about the longest two days of my life, lol. I used regular painters tape, an X-Acto knife, a lot of patience, and black and white Montana spray paint. I don’t think I can ever look at another X-Acto blade without remembering all the crazy straight lines I carved from the black layer. All in all though it was so worth it. I’m proud of my work and even if I don’t win I get to keep an awesome board. The Bamboo SK8 team suggested that I work a bit of colour into my art but I decided to stay true to the original and keep it really graphic. It’s a solid black and white with a lot of movement and continuous flow on a beautiful bamboo veneer. This is a very comic book, a flat, yet eye catching graphic. The oil droplets from the joints of the dinosaur leads the viewer’s eyes to the tail of the board, which is a puddle of oil that forms a skull. This is to represent what oil truly leads to, nothing but pollution and death. One droplet actually makes a tear drop for the skeleton as it’s trying to flee for its “life” instead of becoming oil. 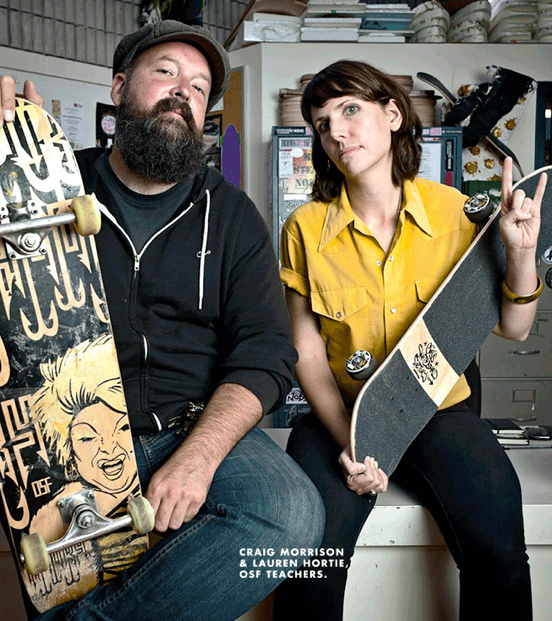 The skateboard that the dinosaur is holding reads “less bones more skaters” as we know oil is a non-reusable resource and we are running out, BUT we don’t need more dinosaur bones… we just need more skaters. So in conclusion, skating or biking or whatever you do instead of driving doesn’t harm the environment, it is part of a healthy lifestyle and is incredibly fun! So get on a skateboard and #SaveTheDinosaurs! Also a REALLY big thank you to Bamboo skateboards in California, you guys are awesome! 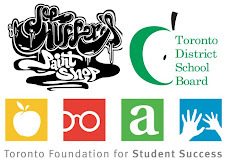 Thanks for teaming up with OSF. Keep it real. For my graphic, I came up with the Bamboo skateboard army of panda’s, starting a revolution to save the earth and all its surrounding beauty. They plan to start by showing the world about the positives about bamboo. I figured I’d make one leader panda that’ll take matter into his own hands and gather up all believers who want to push forward in our giant step to making this world a better place. Here at the Skateboard Factory, they teach us many techniques to apply that picture in your head onto a piece of wood from tape stencils, a printing press, or wood burning. The method I have used for this board is the tape stencils, with layer after layer of tape. Most of the students and I used spray paint to color it in. Afterwards I took a paint marker and fixed-up the lines that were a tad rough. After finishing this project, it really gave me an idea of sustainability. Not only did I learn how to spell it, I also learned that bamboo is a much more sustainable product than maple or any other wood for that matter. People take advantage of this beautiful planet that the “big blue hippo-in-the-sky” gave us everyday, and this project really opened my eyes to the whole “sustainable” subject. It made me a lot more aware of the possible events that could occur if we do not take action sooner than later. Hi, I've been at OSF for about two months and have found the experience rewarding. I’ve found it rewarding because I can actually finish work and I like the outcome of it. One of the things I liked the outcome of was my custom skateboard, that I thought would come out badly and uncentered, but actually it came out perfect! Another skateboard I liked is the bamboo board you guys let me design. I like the graphic but also I like what you guys stand for. I like the bamboo boards because they are light and have a lot of pop, but also because they are sustainable. My skateboard graphic is the world but it is shaped like a piece of bamboo. I made this because I was trying to send out the message that bamboo can hold up the world, metaphorically. Bamboo can hold up the world because it is an alternative to trees and it will never stop growing. I used the world because this is a global issue, and there aren’t really good environmentally friendly products in skateboarding except for bamboo. I used a piece of bamboo because I think that it is one of the most sustainable alternatives to wood. I found my inspiration in this project by learning about how and why bamboo is sustainable. The way I made my graphic was by green taping the entire board and then cutting out the layers of my stenciled graphic, and then painting over it. When I was starting out with my board I didn't really like it, but when I finished it I was really happy with the outcome. I also found that the contest aspect was really motivating, because everyone was really into it and working hard to finish. I learned a lot about bamboo and its sustainability, but also about your company and how you are trying to do your part in saving the earth. My bamboo skateboard design for sustainability represents the deforestation of trees, and as a consequence the habitats of animals. On the board there are three moneys. The one on the top is holding the edge of the board (or whatever you can imagine). The one in the center/ middle of the board is holding a sign exclaiming the damage to his habitat and is surrounded by a tree stump and bamboo shoots, which represents the mass growing of bamboo and how you can get so much more from this sustainable product of nature which is still durable (if not more durable than) than maple. Bamboo does so much less damage to not just trees but to the lives of animals that WILL go extinct if the process of deforestation continues. Last but not least, surrounded by a spray can, sitting on a tree stump, is a monkey who is sand belting the edges of his board made from bamboo. As I have stated above, the graphic on the skateboard is made to represent how much more sustainable bamboo is compared to the huge manufacturing and deforestation process that goes into skateboarding every year. But it also represents the street art/hip hop/skate culture as well as activism and delinquency against a system that is so focused on destroying natural resources. Hi, I am currently a student at Oasis Skateboard Factory as well as an artist and of course a skater. I am in my second semester at OSF and I am loving it. 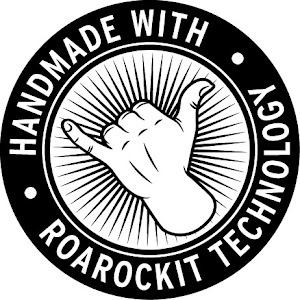 This project is an amazing opportunity to work with a company that not only creates great skateboards but also makes a real difference in the world. It’s amazing that our school teaches sustainability and lets us work with real companies making an impact on the climate change problem. I was recently introduced through my school to a company that makes sustainably sourced chocolate with virtually no carbon footprint, using bicycle and solar power. I have been volunteering helping them with their business and it has been a very rewarding experience for me. I believe we in North America and other developed countries are currently living in a strange utopian bubble. Our society depends on amazing technology that thousands of years of research and development have created. If you have the money you’re every whim or fantasy can be fulfilled. But it is a bubble very close to getting popped! We are very slowly becoming aware of and accepting some very sad realities about where our world is going and if we stay on this path those realities are not pretty at all. But it is not too late, we still have the time, the know-how, and the technology to turn things around; places like Bamboo Skateboards and other social enterprises that make sustainability a priority are on the right track. My graphic is focused on the idea of not only recycling and re-using but also closing the loop of waste. Every year thousands of pounds of perfectly good wood are dumped into landfill when they could be relatively easily re-used. The idea in my graphic: why not put that wood to work to build new houses, tables, chairs, staircases, armoires, but best of all skateboards! In the State of the Union address this year, the President of the United States talked about the idea of market-based solutions to fix our environmental decay. This is exactly what we need right now and my graphic is about a way to save our environment and still make some money, which is practically the definition of a social enterprise. Thank you for this opportunity to work with you, and I look forward to getting some feedback on the graphic I have created. I am currently a student at OSF. Sadly I am here for only one semester; I only found out about this amazing school last semester. 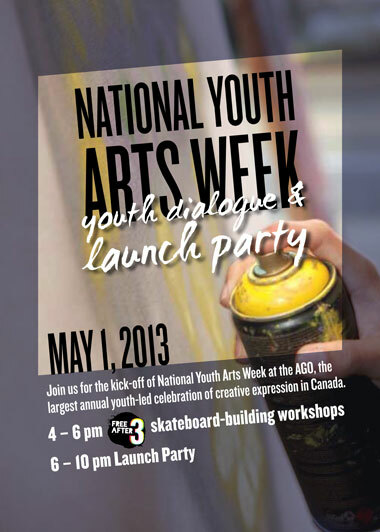 During my time here though I have found out a lot about skateboarding and longboarding, art and myself. I am also a vegetarian, which relates to my bamboo graphic theme, which is about food sustainability and the mass production of animals. My graphic focuses specifically on the production of cattle. The cows are over-bread, squeezed into small environments together and pumped with antibiotics. That is only the start of the horror. My inspiration for this design is to open people’s eyes to industrial meat production. 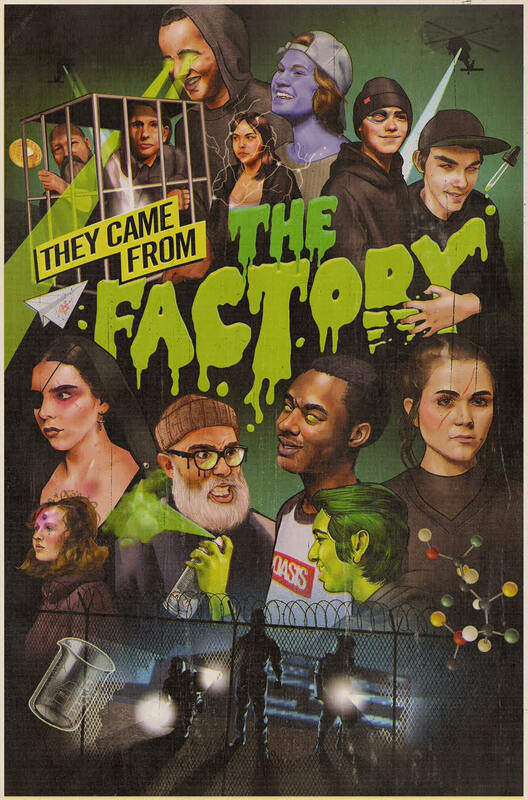 The meaning of the images I used explains how the factories work. At the top of the board you can see all the cows hanging with not much space and they do not look very appetizing because they are not. The cows are also a greenish dead colour because they are all not really healthy because they do not get fed properly or taken care of much. Luckily there is meat made well at organic farms where they treat the animals well, take care of their health and they usually get slaughtered closer to where they are sold so they do not need preservatives. The materials I used for this board are spray paint stencils and paint marker. The elements of design on this board contain a colour style that is represents dullness and unhealthy looking colours. I feel pretty good about the deck but wish I did maybe a bit of a different colour scheme but colours define the vibe of the board. I am very happy that I am in this contest and I do not wish to necessarily win, but being a participant is enough for me. During the process of making this graphic I have also learned more about graphic design. I am very happy to be a part of the sustainable movement and wish you guys at Bamboo Skateboards the best of luck! This is my first semester at Oasis Skateboard Factory and I currently ride a longboard and now am getting back into skateboarding. The theme of my board is the extinction of animals due to the overflow of need for oil. 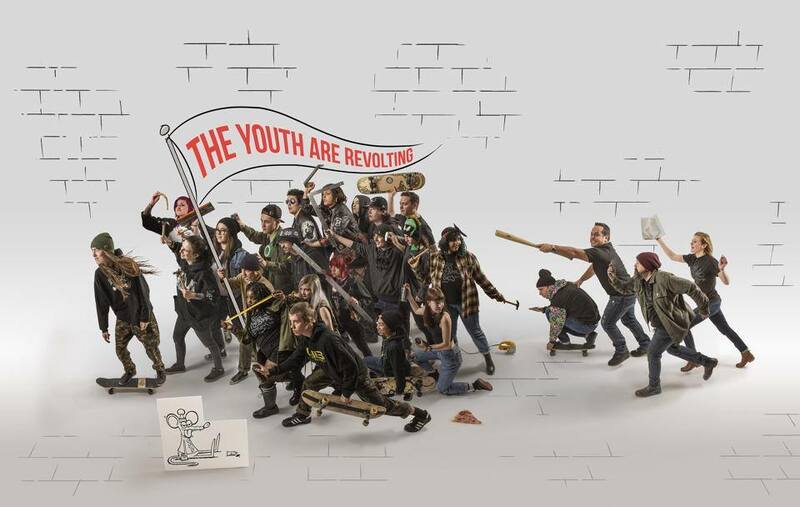 The concept behind my image is that the animals that are going extinct are fighting back. The meaning of the old gas pump is that our old ways take an effect into problems now with extinction. I think this board has two places where sustainability really shines through: sustainability of animal’s habitats and sustainability for oil and how we are going to limit the amount of oil people use on a day-to-day basis. Materials used were green low-tack tape and a Montana spray paint. I feel like I had a better drawn out template then it actually turned out on the board. The contest had me excited so I tried to finish it quickly, this is when I ran into a problem with high-tack tape that brought up a lot of paint when I took it off due to the fact that the boards were sealed before we got them so the paint did not fully dry. All in all I thought it was a great experience, I’m very happy with the finished product and in terms of the contest I’m excited to see the results. I would also like to thank Bamboo Skateboards for letting us have this opportunity and look forward to working with them in the near future. Greetings from Oasis! 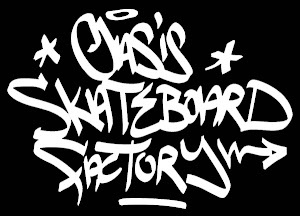 I'm 17 and a second semester student from Oasis Skateboard Factory. My board is related to sustainability because it’s a panda named Buddha the Bamboo Skateboards mascot sitting in a recycling bin eating the world. He is eating the world because it is corrupt and falling apart. If he destroys it he can turn it into a newer, better planet, one that will not destroy its self and depend on surviving by killing its resources. The methods and techniques I used to create this graphic are the street techniques of stenciling. I stenciled the graphic on with the color scheme I designed in my template. I feel that this board is a good, positive image to represent sustainability. I learned that to design a good graphic takes a lot of dedicated time and concentration. 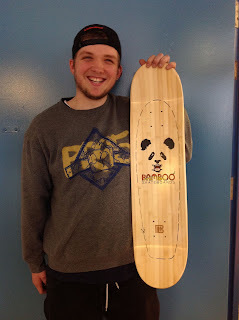 It was a great experience working with Bamboo Skateboards. Pce out! I have been enrolled at OSF for a semester and a half now! Being at OSF is such an eye opening experience, the people you meet and the things that you do and learn all really change your perception of what life is and how we as inhabitants of it have to appreciate and explore! 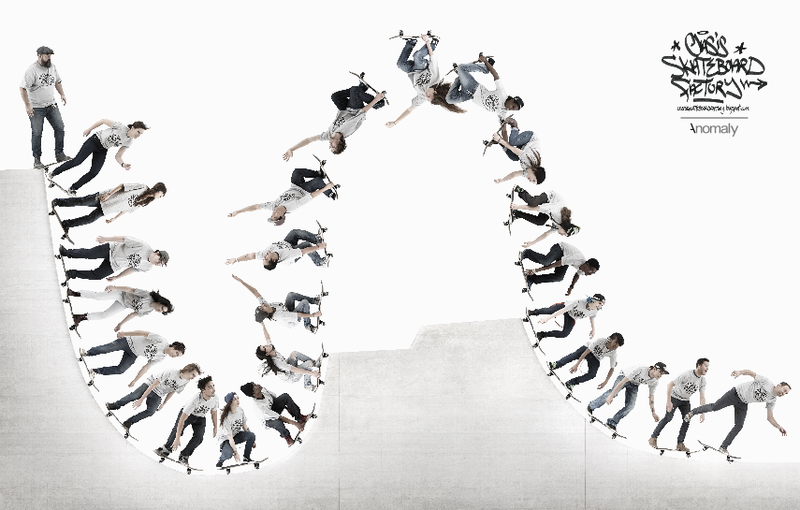 My mindset coming into this project was excitement to work with a company that I have been thoroughly ecstatic about after riding their boards for a long time. 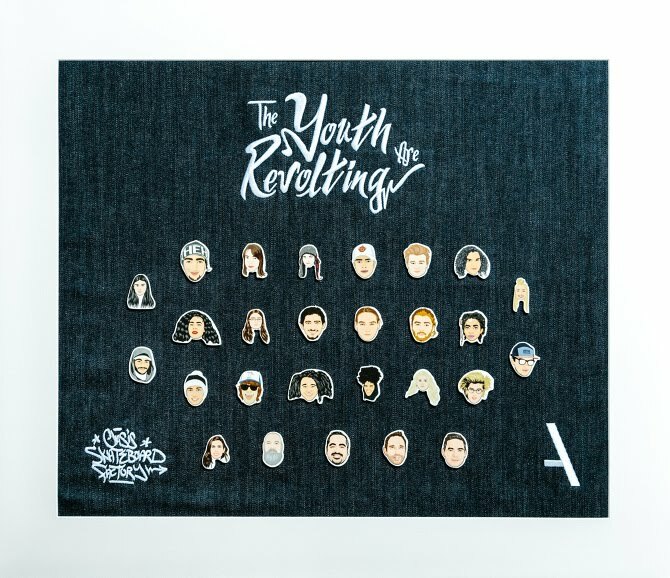 I had never thought about their message so I did some research on their sustainability ideas and what the company was really trying to portray in the community. After all that I soon understood that what they want is exactly what I have been taught through OSF. Upcycling and renewal of well-used products is something the world has been looking at for a while now but has really only been showing it visually and not physically. My double-sided graphic not only visually portrays sustainability but also uses the outline of a mini board to physically make the consumer think about what they bought and how it can be used in more than one way. On the bottom my graphic shows "BAMBOODAH" peacefully eating the bamboo around him sustaining the eco system by making sure there is no over growth so other animals can roam through the jungle and hunt they're own prey! My other side like I said has a template with an updated version of the Bamboo Skateboards logo and the panda head above it. Around the simplistic Bamboo Skateboards design is a thin line silhouetting a mini board with a pair of scissors showing that you can use that board as more than a street skating deck. A cruiser is what you get afterwards but the feeling of making your own deck is the best part of the aftermath. Knowing that you've helped the world by not buying a new board and helped yourself by saving money. After it all, I’ve learned a lot about sustainability and how to change the world with different thinking methods and practices. Hopefully everyone in the world figures out a way to introduce sustainability into his or her lives! 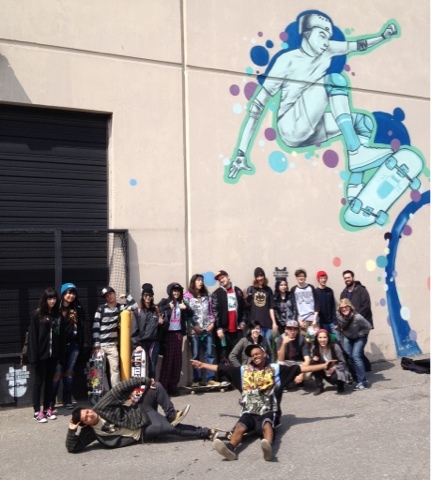 SKATERS SUPPORT DIVERSITY: OSF Pink Day! Hamish from PICNIC boards in the house!